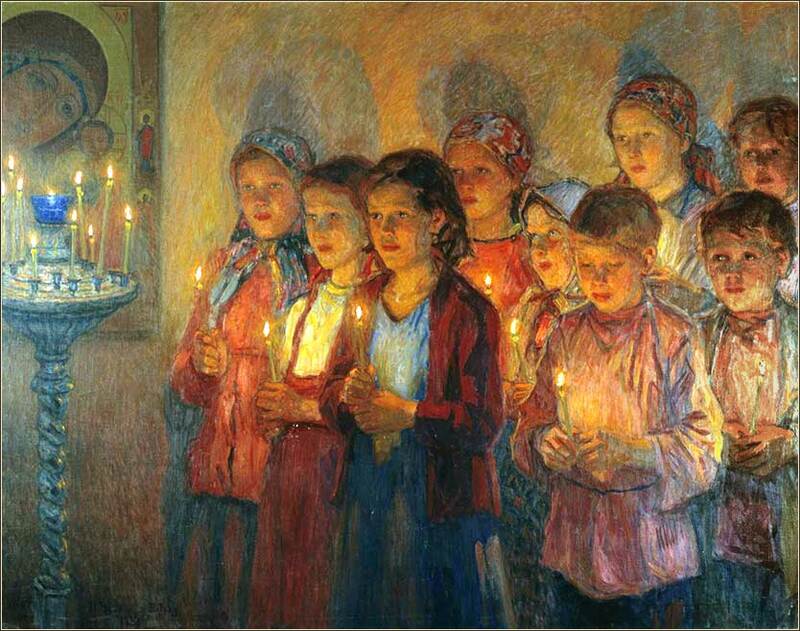 In Church by Nikolai Bogdanov-Belsky, ca. 1939. 304 people in our community are currently praying with you. That's what he came down for. He made me everything to me. 'Cause I Found a better way. Hallelujah! The sun has risen again and it is morning! And I have awoken into it, alive, breathing, thinking, knowing that the Son will rise again and I will be saved. What did I do to deserve this day? It is a gift from you. Glory and praise to you, my God: Father, Son, and Holy Spirit, for filling me with life to live another day, for it is you who made me and not me myself. So dwell in me, I pray to thee, 'til breath shall pass away. 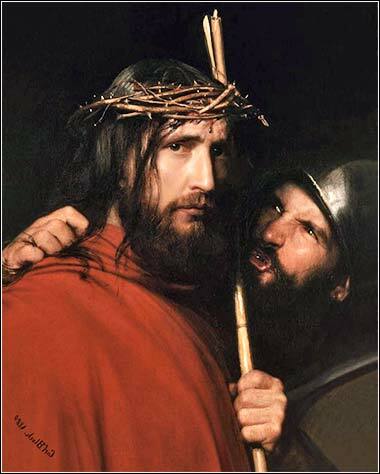 Christ Mocked by a Soldier by Carl Bloch, ca. 1872. 1-2 Think about the eldest son of a great lord. When he is a child, he is little different from one of the servants, because he lives under the authority of nannies, teachers, and guardians. He has no actual power or property of his own - he has to do what they tell him to do, until the time set by his father for him to inherit. 3 We are like this. When we were children, we were under the authority of the visible world, little different from those who are slaves to sin. The Law was our guardian and disciplinarian - not the source of our inheritance. 4-7 But when the time set by the Father arrived, He sent His Son to be born of a woman, a human like us, subject to the Law. As the rightful heir of God’s promise, He received the power to make us co-heirs by adoption and thus become the true children of God. And it is because we are God’s children that He sent the Spirit of His Son into your hearts to cry, “Our Dear Father!” Brothers and sisters, you are servants no longer; you are grown sons and daughters, the rightful heirs of God through Jesus Christ. 3, 8-9 Humanity is born into slavery, its master the elemental forces of nature. These forces are not gods. We were enslaved to a new master, the Law, so that we might be ready to know the only actual God through Christ. Now, having come to know the true God – and to be known by God – how could you possibly want to return to slavery? Why would you want to call the spiritless urgings of nature your master, or chain yourself to a body of lifeless rules? 10-11 Yet you revert to the ritual observance of days (and months, and seasons, and years). I despair that you might be lost, that my time and effort will have been spent in vain. Although we discussed this passage several days ago, we might not have done it justice. I do not give personal witness often in these Notes, but the deep meaning of Galatians 4 has had a profound impact upon my personal journey; and so, at the risk of some repetition, let us flesh out one of its implications. We hear the word “joy” often in Christian circles, and I'm not sure we — or at least I — fully grasp how we might be joyful in Christ. I am not talking about the spiritually ecstatic moments, as wonderful as they are and as wide as they might range, from the Catholic kneeling in silent prayer in a great cathedral, to the evangelical worshipper praising God with his hands lifted. Rather, I am thinking about how the moral human being suffers from guilt and shame. Christ does not relieve us from all of our suffering, while we are alive on earth. Most of the prayer requests I hear are for somebody who is financially troubled, or who has a family member in trouble with the law or terribly ill, and they pray that their suffering on earth may be relieved. The Holy Spirit will always come to comfort us; and Christ may heal us from an illness or relieve us in any way that is His will. But not always. In fact, Christ actually promises that we will suffer; He calls us to suffering in His name. When He says, “Pick up my cross,” what do people think He means? Just last night I was studying the end of the Gospel of John. Christ first rehabilitates Peter from his three denials, by asking him, “Do you love me?” three times, and then telling Peter to “feed my lambs” and “tend to my sheep”, i.e., to bring people to Christ and then take care of them. (John 21:15-23) He then tells Peter, “Follow me.” The meaning of “follow me,” if one reads the entire passage carefully, does not simply mean “be my disciple” or “spend your life serving me.” Christ explicitly tells Peter that he, Peter, will be crucified; he will physically follow Christ to the cross itself. This may seem an odd way to bring up joyfulness, but we need to remember that joy does not necessarily include freedom from mortal suffering: illness, physical pain, loss of those we love, and other such terrible events. And even the most fortunate of us will suffer death. The odds of our dying are roughly 100%. But, when Peter tells us “Brothers and sisters, you are servants no longer; you are sons and daughters, the rightful heirs of God through Jesus Christ,” he means that we are no longer subject to the scheme of the Law of Moses. We cannot earn our way into salvation; it is a gift. By the same token, it is a gift we have received. We are, by the grace of God, forgiven for every single thing we have done wrong. And if God forgives us, we must forgive others and we must forgive ourselves. The joy of the Christian, in part, is that we no longer live as children awaiting our inheritance, subject to discipline; we are no longer servants of the Law. We have been forgiven our sins. We forgive the sins of other. And, coming to the point, we must also forgive ourselves. To dwell in guilt or shame is to reject the gift of grace. We might feel regret; we might learn from our mistakes and strive not to repeat them. But we do not need to suffer the psychological pain of one who is tortured by a past sin. Whether our sin is as small as sharp word we spoke to another, or as great as a murder we committed, Christ will forgive us. And if God forgives us, who are we to judge ourselves? If we welcome humility, we will not feel shame; if we welcome forgiveness, we will not feel guilt. Our pain at our own sin, and our pain at the sin of others, becomes closer and closer to non-existent as we draw closer to closer to Christ. We may weep in sympathy with the afflicted, and we may weep in the pain of suffering; but we need not weep in shame. Proverbs 3:5: Trust in the Lord with all your heart, and lean not on your own understanding.